Jumping exercises, or plyometrics, are high-intensity, explosive movements that increase your heart rate and improve your athleticism while burning serious calories. Tough and highly efficient, jumping workouts are perfect when you’re short on time. The intense nature of plyometric exercises keeps your workout brief while still challenging your body. Plus most jumping exercises require no equipment at all so you can do them at home. Since plyometrics are taxing to the nervous system and require flexibility, it’s important that you fit in a good warm up before you get to jumping. We recommend starting with 20 bodyweight squats to prepare your body for jumping. Then, when you’re ready, perform each of these exercises for 20 seconds then rest for 10 seconds before moving on to the next exercise. After you’ve completed your fourth and final exercise, repeat the circuit once more. If you feel up to it, go for a third round. 1. Stand with your feet beneath your shoulders. 2. Inhale and lower your body like you’re sitting down in a chair. Keep the back neutral, chest up and core engaged. 3. Push your feet into the ground like you’re trying to split apart the floor beneath you; this will help engage your glutes. 4. Lower your body until your thighs are at least parallel to the ground. 5. Keep your torso stiff as you exhale, and spring your body back up to standing by jumping. 6. As you return to the ground, carefully lower your body back down into a squat. 3. Lower your body into a squatting position, place your hands on the floor in front of you. 4. Brace your core and step your feet back so that you’re in push-up position. 5. Hop both your feet back to their original position in the squat. 6. From the squat, spring up into the air while clapping your arms overhead. 1. Stand with you feet together and arms at your sides. 2. Slightly bend your knees, and hop up. 4. Your feet should land shoulder width or wider as your hands meet above your head with arms slightly bent. 5. Hop and bring your limbs back to the standing position. 1. Get into a pushup position: place your hands on the ground slightly wider than shoulders width apart, engage your core to stiffen your torso, keep your feet together and your glutes firm. 2. Bring your right knee toward your left elbow. 4. Bring your left knee to your right elbow. 5. Continue alternating legs at a fast pace. Cool down by marching in place or doing some bodyweight squats, and end with some gentle stretching. If you like the idea of doing a quick, cardio-based plyometric workout from home, there’s no better way than with a jump rope. 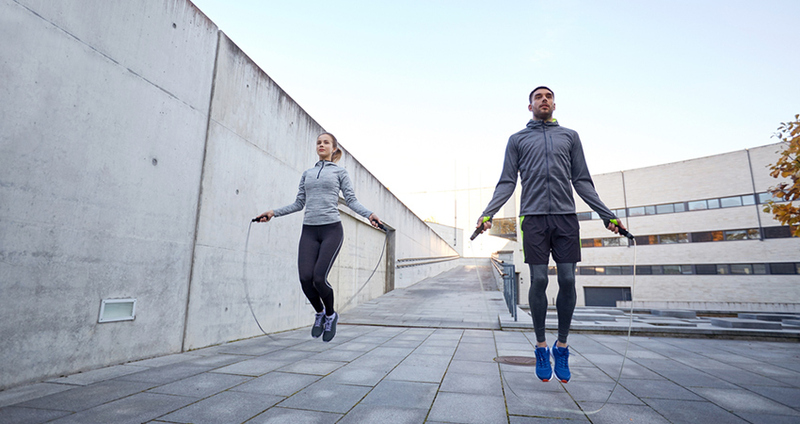 Jumping rope can burn 10 calories in a minute while giving your legs, glutes, shoulders and arms a great workout. Ready to pick up your jump rope? Try this fat blasting jump rope workout by Nora Tobin of Shape.com. Plyometric exercises are a great way to improve your athletic performance, especially since most sports involve jumping and other explosive movements. If you want to elevate your game, consider adding plyometrics to your training. Strength coach Juan Carlos Santana created this Jump Higher for Basketball Season program to simulate basketball movements in speed, biomechanics and resistance. Are you familiar with the CrossFit Games? One of the superhuman feats of strength performed at the games is the box jump. Box jumps are a great exercise to add to your routine because they stimulate fast-twitch muscle fibres by requiring your leg and core muscles to contract very quickly, so you can generate maximal force with each leap. If you’d like to learn how to box jump read Muscle & Fitness’s article, “Box Jump to a Better Body” by conditioning specialist Justin Ginnnell. If you’re looking for exercises that improve athletic performance and burn calories in record time, leap into plyometric training. Jumping workouts are a fun and challenging way to reach your fitness goals.